Additive Manufacturing for the Aerospace Industry explores the design, processing, metallurgy and applications of additive manufacturing (AM) within the aerospace industry. The book's editors have assembled an international team of experts who discuss recent developments and the future prospects of additive manufacturing. The work includes a review of the advantages of AM over conventionally subtractive fabrication, including cost considerations. Microstructures and mechanical properties are also presented, along with examples of components fabricated by AM. Readers will find information on a broad range of materials and processes used in additive manufacturing. 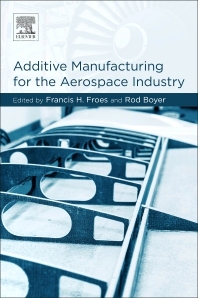 It is ideal reading for those in academia, government labs, component fabricators, and research institutes, but will also appeal to all sectors of the aerospace industry. Dr. Froes has been involved in the Titanium field with an emphasis on Powder Metallurgy (P/M) for more than 40 years. He was employed by a primary Titanium producer—Crucible Steel Company—where he was leader of the Titanium group. He was the program manager on a multi-million dollar US Air Force (USAF) contract on Titanium P/M. He then spent time at the USAF Materials Lab where he was supervisor of the Light Metals group (which included Titanium). This was followed by 17 years at the University of Idaho where he was a Director and Department Head of the Materials Science and Engineering Department. He has over 800 publications, in excess of 60 patents, and has edited almost 30 books—the majority on various aspects of Titanium again with an emphasis on P/M. He gave the key-note presentation at the first TDA (ITA) Conference. In recent years he has co-sponsored four TMS Symposia on Cost Effective Titanium featuring numerous papers on P/M. He is a Fellow of ASM, is a member of the Russian Academy of Science, and was awarded the Service to Powder Metallurgy by the Metal Powder Association. Rod Boyer was employed at The Boeing Company from 1965 through 2011, and is now a consultant. He has specialized in titanium for over 40 years. Mr. Boyer, a Fellow of ASM and Boeing Technical Fellow, received the Russ Ogden Award from ASTM for outstanding achievements in the areas of reactive and refractory metals and the ASM William Hunt Wiseman Award for outstanding achievements in the development and implementation of titanium alloys and processes for aircraft use. During his tenure at Boeing, Mr. Boyer was a titanium specialist involved in basic research, development and applications of titanium alloys for airframes. He has done research on all product forms used on aircraft, and studied almost all of the processes involved in the fabrication of titanium components, from mill processing to machining and chemical processing. He had a strong focus on powder metallurgy during his last three years at Boeing. He has co-edited 6 books, the most notable being the Titanium Alloys Materials Properties Handbook published by ASM. He has over 250 technical presentations and publications, including 35 invited presentations at the regional, national and international levels, with 7 plenary/keynote presentations at the national level and 11 at international symposia.